2 Ortofon Concorde PRO S & Technics Headshell + Stylus + Spare Stanton 500 +++. ORTOFON CONCORDE PRO S DJ CARTRIDGE/STYLUS (Never Used). In green display box. Dispatched with Royal Mail 1st Class. Ortofon concorde cartridge pro stylus please note is damage!! It has a break on the needle. The MK1 has very little difference and remains a firm favourite of DJ’s worldwide. From the Ortofon Website Concorde Nightclub MKII Nightclub E Stylus. Good condition, plenty wear left on both stylus. Ortofon Concorde Q bert Cart & Stylus !!! Authorised Reloop Dealer. The Concorde Black boasts low vinyl wearout characteristics and a spherical stylus, while especially good sound characteristics emphasise its quality as a good all-rounder. Spherical stylus. Item condition: • new other ex display- packaging missing • tested • fully working order * available for sale: 2 * sold without overhang gauge Includes: • Ortofon Concorde PRO S Cartridge & Stylus Needle / Stylus Guard * all photos are from actual product, you will receive what you see in photos. Ortophon DJ models expose the highest output compared to any other makes. Stylus type: Spherical. Stylus tip radius: R 18 µm. • used - mint condition. Item condition Compliance, dynamic lateral: 9 µm/m N.
This excellent quality spherical stylus is perfect for any talented DJ that likes to scratch and will prove very durable. Channel balance at 1kHz. Frequency range at -3dB. Stylus type. Compliance, dynamic lateral. The cartridge and the Stylus are both in full working order and in good condition. Sorry no box but will be packed very carefully to ensure a safe arrival and anyhow is going to stay in your turntable so you don’t really need the box (I throw it away when I got it). The finger lift has being replaced with a brand new original Ortofon Mk2 Fingerlift. Item condition: • Used Includes: • Ortofon Concorde Flightcase Serato II * all photos are from actual product, you will receive what you see in photos. Reloop Ortofon Concorde Blue DJ Turntable Vinyl Record Cartridge & Stylus Needle. Ortofon Flight Case for 2x Concorde Cartridges & Styli Needle Twin Flightcase in used but good condition with some age related marks but nothing that makes it look old nor tatty (just see photos for a more accurate description as I think is the best way to describe the condition of an item). Concorde S Super Scratch - Cartridge and needle by Ortofon .C. Reloop Concorde Blue are appropriate for scratching, they have a high output level and excellent sound characteristics. Spherical stylus. Need it fast?. Authorised UK dealer for. Why use us?. Hard/Soft Case Hard. Why people choose Bop DJ. Warranty Full Manufacturer's Warranty. Genuine Ortofon product. 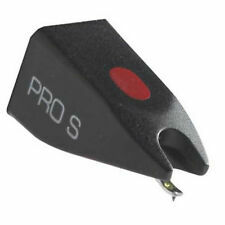 The Pro has a good-quality spherical stylus, a rock-solid cantilever, and serves general purposes well. Spherical stylus. Authorised UK dealer for. Why use us?. MORE USEFUL INFORMATION. Ortofon OM3 ,OM5, OMB5E, CL10, CL20, CL30, CONCORDE, OM, TM A29, TM, STYLUS 5. Aiwa STYLUS 5. Also Suitable for Order information Akai LMB12, LMB5, RS41, RS5. Ortofon NightClub E MkII Stylus. Why people choose Bop DJ. BOP DJ Showrooms. Stylus Type Elliptical. Made by Ortofon. Special spherical stylus. Frequency range: 20 Hz - 18 kHz. TECHNICAL DATA. Balanced sound, slight accentuation of the bass range. Item condition: • used • fully working order * sold without overhang gauge Includes: •1 x Ortofon Concorde Cartridge Q-Bert Thud Rumble with Stylus Pro & Needle Guard * all photos are from actual product, you will receive what you see in photos. Item condition: • Used * available for sale : 2 Includes: • Ortofon Concorde Flightcase * all photos are from actual product, you will receive what you see in photos. Type of Stylus : 0.7 mil spherical diamond. Channel balance at 1000 Hz : 2 dB. Item condition: • used *available for sale: 2 Includes: • Ortofon Concorde OM Velvet Case * all photos are from actual product, you will receive what you see in photos.